When the Mruthinti family visited their many relatives in India a few years ago, Shyamala Mruthinti, the mother of three daughters, wanted her children to appear appropriate and respectful of her homeland. She insisted that they pack only traditional Indian clothes, the tunic-like dresses worn over loose pants. When they arrived, her three pretty, stylish teenage daughters—all Emory students—were more than a little put out to find their Indian-born cousins wearing low-slung jeans and fitted T-shirts, the type of clothing you’d find at Lenox Mall. The scene might have been a little embarrassing for Harshita Mruthinti 04C 11PhD, Navyata 06C 07MPH, and Namrata 08C, but it also was somewhat typical of their upbringing. Their parents, who immigrated to the United States in 1986 with their two older daughters—their third was born here—are deeply committed to raising their children in the Hindu tradition. Surrounded by McDonald’s restaurants and Baptist churches in south Georgia, they are obliged to approach their faith in a more thoughtful, deliberate way than their family in India because it is not part of the cultural fabric here; they must create their practices themselves. The concentrated effort the Mruthintis have made to incorporate their Hindu spirituality into their lives, they say, has served to strengthen their faith, both individually and as a family. The Mruthinti family found that by learning and practicing the Hindu faith together, they built a strong foundation for their three daughters, all of whom continued to explore the religion at Emory. 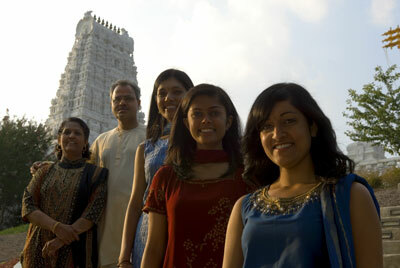 From left: Shyamala, Swamy, Harshita, Namrata, and Navyata. Both Swamy and Shyamala Mruthinti have PhDs from Indian universities, Swamy in biochemistry and Shyamala in immunology. Swamy is a professor at West Georgia College, while Shyamala is researching Alzheimer’s disease at the Medical College of Georgia. After twenty years in the U.S., they still recall the dramatic culture shock they felt when they first came. The language, clothing styles, social norms, and particularly American food all were challenging to get used to; but they did find a supportive community in Augusta’s Hindu Temple, where they have been “active since day one,” Swamy says. With a membership of more than five hundred, the temple serves as a central force for the Mruthintis, the place where they celebrate Hindu festivals and holidays. The three daughters attended Balshela, the children’s program, and once a month the entire community gathers for a service. In India, Hindu traditions are so much a part of day-to-day social life that the Mruthintis’ cousins do not visit non-Hindu homes. It’s the philosophical foundation for the way they cook, dance, socialize, and observe milestones. By contrast, Navyata was the only Indian and Hindu student in her class at her Augusta high school. Navyata’s parents acknowledge that some “watering down” of the religious experience is bound to take place, but they have tried to preserve the authenticity and cultivate their children’s natural curiosity about Hinduism. Hinduism is considered to be the world’s oldest religion and the third largest, with more than a billion followers, some 890 million in India. The faith places responsibility on the individual to seek a personal connection with God, or Brahman, the cosmic spirit and infinite principle worshiped in many different forms. Each morning, says Shyamala, the Mruthintis get up, shower, and then go into a special prayer room, a puja room. The tiny room (a former closet) is crowded with pictures, statues of the deities, and colorful pillows. Before praying, they raise a lighted oil lamp to the deity, symbolic of knowledge and purity. In the evenings, they offer food to God before eating. When the family began visiting colleges, says Swamy, they paid close attention to the indicators of diversity at each school and were impressed with Emory’s religious-life programs. All three Mruthinti daughters belonged to the Hindu Students Council (HSC), a group devoted to the exploration and practice of Hinduism, which lent structure to their religious experience. They learned about differences in Hindu customs and how to find common ground with other Hindu students. Although the focus of the organization is on education more than practice, Navyata says she was surprised by how much she learned and was able to incorporate some practices like those she was accustomed to at home. Navyata and Harshita also served on the board of the Inter-Religious Council, which exposed them to many other faiths. Navyata particularly remembers an organized discussion between Hindu and Muslim women. This summer, Harshita spent eight weeks in India, learning the language and studying Indian classical dance. She is earning her PhD in religion at Emory with a focus on the divine feminine in Hinduism. Navyata has started the master’s program at the Rollins School of Public Health, while Namrata, a junior this year, is majoring in visual arts and art history.